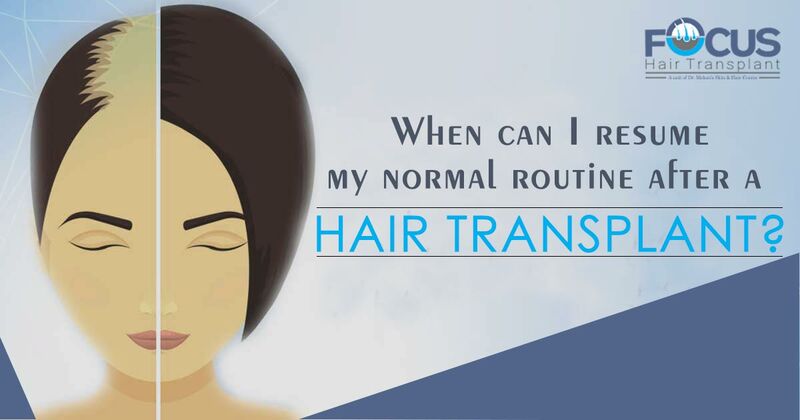 When can I resume my normal routine after a Hair Transplant? Hair transplant in India is widely popular treatment and is being preferred due to its optimized results and faster recovery. But it can be difficult for anyone to wait for the results and to get back to his normal routine during the recovery period. Every patient remain curious to see his fuller growth of new hair and to get back to his work after surgery .but the longevity of the recovery period can vary from patient to patient as it depends on the various factors like healing power of the body and the type of hair transplant taken by the patient like FUT or FUE. It is the obvious question that everyone asks from the doctor before and after the hair transplant surgery that when can I get back to my work? What are hair transplant types and how it affects the recovery? Hair transplantation is the surgical procedure in which the loss resistant and healthy follicles are plucked from the safer zone of the scalp and then transplanted in the desired bald or thinning portions of the scalp. It is the outpatient procedure so there is no need to stay overnight in the hospital after the surgery means on the surgical day patient can get back to his home after the few hours of the surgery. Hair transplant is basically performed with two methods FUT and FUE. In the FUT method linear strip of skin bearing hair follicles is removed from the back head so it leaves the linear scar that needs to be closed with stitches. Thus in the FUT method recovery period can be longer as the linear scar takes time to get healed. Even in this method patient is given bandage so after few days of the surgery patient is asked to visit the center for removing the bandage thus after FUT method patient need to wait for more days to get back to his work. Opposite to that FUE method is an advanced method of hair restoration in which individual hair follicles are plucked from the door area of the scalp randomly means in this method patient do not have the linear scar and wound and even there is no need of stitches or bandage. Thus this method has lesser downtime means in 4-5days patient can get back to his work.